Whether you love them or are sick of them, over the last couple of years, the “Top 10 List of…” type articles have certainly taken over the majority of many blogs’ content. Although the number and description may vary (Top 5 Worst…, Top 10 Best…, 10 Simple Things…, etc. ), the general formula remains the same: Start with an expository introduction, possibly include a couple of clever quips by the author, and get right to the list. But what has made the Top 10 List formula so popular that it has practically become the go-to standard for so many blogs? Below are the Top 10 9 reasons why I believe the Top 10 Lists have taken over. It doesn’t matter the subject of your blog, The Top 10 Lists are found across all genres, from humorous websites to online marketing websites, US news, tech, food, entertainment…the websites are endless. No matter the topic, there will always be things that can be itemized and put into list form in each. That’s one of the magic powers of the Top 10 List. If it was an X-Men character, it would be Mystique; shape-shifting to fit whatever the topic at hand may be. It’s no secret that writing well is a skill that needs to be developed with practice and instruction, and one that many people still have trouble with well into their adult life. While the education system may share some accountability, not all of the blame should be placed on educators. Afterall, they don’t teach you in school how to ride a bike, do your taxes, or navigate the subtle complexities of maintaining a stable and healthy relationship, but most people tend to figure it out on their own (or some of those things anyway). But getting back to my point, great writing skills are not needed to create a list. Expository writing, circumlocution, narrative interspersion, and recursion are all writing elements that need not apply when creating a list of ‘Top 10 Social Media Fails’. Let’s face it, people have short attention spans these days. Hmm, I could go for some Szechuan right about now…Sorry, where was I? Ah yes, in fact, according to a Pew Internet study, the current generation of internet consumers live in a world of “instant gratification and quick fixes” which leads to a “loss of patience and a lack of deep thinking.” [Janna Anderson and Lee Rainie, PewResearch Internet Project] In other words, we don’t have the patience to read a full page article. However, by breaking it down into a list of 10 or so items, it can fool the brain into staying in focus. Even if the number of words are the same, by having it in list form, your brain “jumps” from one item to the next with anticipation of what the next item might be. Of course, there are many Top 10 Lists that forego the text altogether and simply list the items or pictures, in which case there is no need to trick the brain. It’s just a short list. With our busy on-the-go lifestyles, who has time to read an article in one sitting? Whether you’re reading an article during bathroom breaks, while dodging panhandlers walking down the sidewalk, waiting in line at Starbucks, or when stopped at a red light (I’m kidding, don’t do that), our online reading time is constantly being interrupted by the inconvenience of real life activities. If you were reading an actual article, you would never be able to keep your place and would consequently have to backtrack many times in order to find where you left off. However, with Top 10 Lists, you can easily read one item, look up to interact with the person behind the counter who’s now emphatically waving your change and receipt in your face, and deftly find your place again once the angry mob behind you subsides. As much as I prefer browsing the web on my phone or tablet for the simple reason of ease of mobility, the one thing I do hate is the physical act of reading articles on my phone. Either you have to constantly scroll back and forth to read full sentences, subsequently losing your place on numerous occasions, or you have to zoom out enough so that the whole paragraph fits on your screen. Of course, if you do that the font size is equivalent to fine print, and you end up holding the phone so close to your face you can literally feel the warmth of the screen on your retinas. Top 10 Lists can help with that issue again by not only limiting the text, but by making it a possibility to have each item posted on a separate page. While some people may find that annoying, especially if you don’t have a great WiFi connection and you have to wait for each page to load, it is still a doable action. If each paragraph was listed on a separate page in a traditional article, chances are most people will abandon the article after the 3rd page. 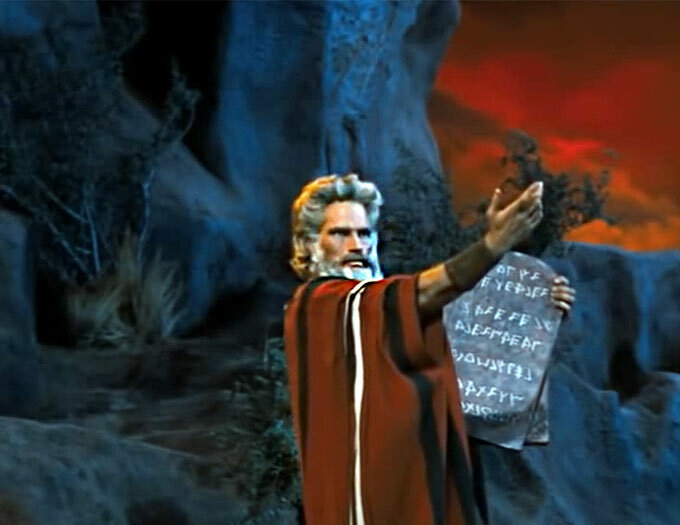 When it all comes down to it, I think we have Moses to partially thank for coming up with what could only be considered the ultimate indie-version of the Top 10 List: The 10 Commandments. Being the hipster he was, Moses became a trendsetter by rocking the Top 10 List way before the concept was even a thing. But people loved it, and over the millenniums it has become perhaps one of the most enduring legacies of the Bible. Afterall, how many people do you know who have actually read the Bible? Even some of the most religious people I know have never actually read it, but I have yet to meet anyone (religious or not) who have never read Moses’ TL;DR version. This reason is perhaps more psychological than the others on this list, but it is always interesting that whenever a potential list is brought up, the initial urge is to put 10 of whatever on it. But why is that? Sure, it’s a nice round number, but so are a lot of numbers. Again, I think this harkens back to the good old days of using our fingers to count. Unless you had some sort of hand anomaly, 10 was the ultimate goal to reach as a child. It only stood to reason that since you had no more fingers to count on, this was the highest number in the world. As we grew older, we of course discovered the number eleven, and it blew our minds. However, that still didn’t prevent some of us (myself included) from internalizing that finger counting and then redistributing it in the form of hand gestures whenever I’m vocally counting off a list. This is especially the case whenever emotions are heightened and a need to emphasize my point results in a continuing series of theatrically extended digits. For something that is so ingrained in our childhood, and subsequently the way we communicate later on, it’s hard to dismiss the list of 10 as an arbitrary figure. That’s why it feels most “comfortable” to have a list of 10. As a blog writer, sometimes it can be hard to find examples to back up your article’s point, and while you know they’re out there, you have a deadline and don’t have the time or patience to search them out. What’s great about Top 10 Lists is that you can easily turn that Top 10 List into a Top 9 List without skipping a beat and your audience will be none the wiser. If you were writing a traditional article, you can’t just stop ¾ of the way through and hit “Publish”. You have to wrap up what you are saying, make sure all points you touched upon are flushed out within the piece, and come up with an appropriate conclusion. It’s a more delicate process than a list, and therefore not as easy to scale back once you decide you’ve had enough. Once again, this reason is more psychological and concerns human nature at its most fundamental, but people tend to have an intrinsic need to categorize things. They also have a desire to rank things from best to worst (or vice versa). Whether filling out forms, classifying types of music, or now Facebook’s 51 new gender options, it seems we can’t exist as a society without needing to categorize ourselves and our tastes. I’m not exactly sure why that is. Perhaps as a species, identity has become intrinsically intertwined with language. If a tree falls in a forest, does it make a sound? If there isn’t a word for something, does it really exist? This is the core of humanity: The world only exists in relation to ourselves. In the same vein, ranking has been instilled in us since birth. Perhaps it started with tastes (strained carrots taste better than strained peas, therefore carrots are better), moving onto being graded in school, social interaction and dating, performance reviews at work, and countless other constant ranking systems persistent in our culture. We always want the best for ourselves, but how are we to know what’s best without some sort of system to let us know which is better or worse? Maybe life itself is just one big Top 10 List and…Alright, maybe I should stop there before I get carried away and need to categorize this post as a Philosophy/Sociology article… My point being is that we are hardwired toward having a predilection for lists. Plain and simple. So the next time you find yourself reading (or writing) that click-bait article, “Top 10 Reasons Why Kim Kardashian is More Important Than Abraham Lincoln,” just know there is a lot more going on behind the scenes than is evident at first glance. I’ve been thinking and writing about mobile responsive emails so your item “Good Format for Phones” resonated with me. Really something to think about when we’re putting out blog posts. Yeah, as more people turn to mobile devices to browse the web, it’ll be interesting to see how much the web changes in the next few years. Thank you very much Krithika! Glad to hear it was among your top 10 cures for Monday Morning Migraines.